Revealing the true history of Krisna Consciousness in the West. SSR 4 Understanding Krsna and Christ In 1974, near Prabhupada's center in Frankfurt am Main, West Germany, Srila Prabhupada and several of his disciples took a morning walk with father Emmanuel Jungclaussen, a Benedictine monk from Niederalteich Monastery. Noticing that Srila Prabhupada was carrying meditation beads similar to the rosary, Father Emmanuel explained that he also chanted a constant prayer: "Lord Jesus Christ, be merciful unto us." The following conversation ensued. Srila Prabhupada: What is the meaning of the word Christ? Father Emmanuel: Christ comes from the Greek word Christos, meaning "the anointed one." Srila Prabhupada: Christos is the Greek version of the word Krsna. Father Emmanuel: This is very interesting. Srila Prabhupada: When an Indian person calls on Krsna, he often says, "Krsta." Krsta is a Sanskrit word meaning "attraction." So when we address God as "Christ," "Krsta," or "Krsna," we indicate the same all-attractive Supreme Personality of Godhead. When Jesus said, "Our Father, who an in heaven, sanctified be Thy name," that name of God was "Krsta" or "Krsna." Do you agree? Father Emmanuel: I think Jesus, as the son of God, has revealed to us the actual name of God: Christ. We can call God "Father," but if we want to address Him by His actual name, we have to say "Christ." Srila Prabhupada: Yes. "Christ" is another way of saying Krsta, and "Krsta" is another way of pronouncing Krsna, the name of God. Jesus said that one should glorify the name of God, but yesterday I heard one theologian say that God has no name--that we can call Him only "Father." A son may call his father "Father," but the father also has a specific name. Similarly, "God" is the general name of the Supreme Personality of Godhead, whose specific name is Krsna. Therefore whether you call God "Christ," "Krsta," or "Krsna," ultimately you are addressing the same Supreme Personality of Godhead. Father Emmanuel: Yes, if we speak of God's actual name, then we must say, "Christos." In our religion, we have the Trinity: the Father, Son, and the Holy Spirit. We believe we can know the name of God only by revelation from the Son of God. Jesus Christ revealed the name of the father, and therefore we take the name Christ as the revealed name of God. Srila Prabhupada: Actually, it doesn't matter--Krsna or Christ--the name is the same. The main point is to follow the injunctions of the Vedic scriptures that recommend chanting the name of God in this age. The easiest way is to chant the maha-mantra: Hare Krsna, Hare Krsna, Krsna Krsna, Hare Hare. Hare Rama, Hare Rama, Rama Rama, Hare Hare. Rama and Krsna are names of God, and Hare is the energy of God. So when we chant the maha-mantra, we address God together with His energy. This energy is of two kinds, the spiritual and the material. At present we are in the clutches of the material energy. Therefore we pray to Krsna that He may kindly deliver us from the service of the material energy and accept us into the service of the spiritual energy. That is our whole philosophy. Hare Krsna means, "O energy of God, O God [Krsna], please engage me in Your service." It is our nature to render service. Somehow or other we have come to the service of material things, but when this service is transformed into the service of the spiritual energy, then our life is perfect. To practice bhakti-yoga [loving service to God] means to become free from designations like "Hindu," "Muslim," "Christian," this or that, and simply to serve God. We have created Christian, Hindu, and Muhammadan religions, but when we come to a religion without designations, in which we don't think we are Hindus or Christians or Muhammadans, then we can speak of pure religion, or bhakti. When Lord Jesus Christ presented himself, for instance, he was greatly afflicted by the miserable conditions of the people. Regardless of which country or sect they belong to, all Vaisnavas, or devotees--any people who are God conscious, or Krsna conscious--are thus compassionate. Therefore to blaspheme a Vaisnava, a preacher of God's glories, is a great offense. Engineers have finished the major work of fixing the broken "Big Bang" machine, the largest scientific instrument ever built. The last of 53 replacement magnets for the Large Hadron Collider (LHC) has been lowered into the 16-mile tunnel straddling the Swiss-French border which houses the machine. Scientists said they were on track to re-start the particle accelerator in the autumn. The LHC, based at the Swiss headquarters of the European nuclear research organisation Cern, was switched on in September last year amid a fanfare of publicity. The LHC is designed to collide sub-atomic particles together at energies never before attained. It will re-create the conditions moments after the Big Bang which gave birth to the universe 13.7 billion years ago. A key aim of the LHC is to find the elusive Higgs Boson - nicknamed the "God Particle" - which is believed by theoretical physicists to explain the existence of mass. There is also a chance of the machine creating tiny short-lived black holes, a fact which led to some wild speculation about the Earth being doomed by out-of-control experiments. The super-cooled magnets are used to drive the particles around the LHC's ring-shaped tunnel. Copyright © 2009 The Press Association. This Maha-Visnu, who is creating innumerable universes by breathing... Just like sometimes we breathe and there are some germs, small, we cannot see; in the same way, the universes in a small minute form, they are coming out of the breathing of Maha-Visnu. That is Karana-toya-sayi, karana-udaka, Causal Ocean. That is beginning of creation. Then all the universes, they gradually develop into gigantic form. In the originally, it is coming out. We cannot understand. Sometimes we become surprised that "How such innumerable universes are being created by a person?" So, the universe is not so big in the beginning. Just like our, this body is not so big in the beginning of our body within the womb of our mother. It is not so big. It is very small, minute, and then it becomes just like a pea, and gradually the body develops. The same process is applicable to the universes. In the beginning, they are coming out of the breathing of Karana-toya-sayi Visnu, and then gradually they are developed brhannatvat, brhatvat. It increases gradually. That Karana-toya-sayi Visnu is also Sankarsana. And then Garbhodakasayi. The universes are created. Then, when they develop, then same Visnu, Maha-Visnu, enters into each universe, and He creates an ocean. That is called Garbhoda Ocean. And He lies down there on Sesa-Naga, And then, from the navel, the lotus flower sprouts, and then Lord Brahma is created. Then, after many years tapasya, tapo, he understands how to create. In this way the whole creation of universes takes place. Garbhodakasayi. And after creation of this universe, then same Visnu, Garbhodakasayi, within this universe He creates His own Vaikuntha where there is an ocean of milk. There are different kinds of oceans, we learn from sastra. We have got experience of the salted ocean, but there are many other oceans, just like milk ocean and ghee ocean, oil ocean and yogurt ocean. There are. We get this information from the sastra. So the Maha-Visnu, first of all He enters in each universe as Garbhodakasayi. Then, within the universe, He creates His Vaikuntha and lies down there--Ksirodakasayi. This Ksirodakasayi Visnu is approached by the demigods when there is need of maintenance or for subsiding the disturbance by the demons. Then Brahma, Lord Siva and others, they go on the beach of this milk ocean and submit their appeal. Then the answer is given to Brahma, and he informs to other demigods. This is the process. You'll find this later on. So payobdhi-sayi and sesas ca, Sesa, that is also incarnation of Visnu. He is sustaining the body of Visnu in different oceans, and He is serving the Lord Visnu in so many ways. Sayya, asana, sitting place, bed, and upavita, and clothes, garments--so many ways He is serving. Now, all these different incarnation of Visnu is summarized here by Kaviraja Gosvami that "All of them are partial expansion of Nityananda," to understand what is Nityananda Prabhu. The prakasa-vigraha... Krsna first. Then His prakasa-vigraha, manifested form, a little difference in bodily feature, but the same powerful, that is Balarama. And then, from Balarama, Sankarsana, Pradyumna, Aniruddha, in this way, quadruple expansion... Then Narayana, then another quadruple expansion, then from that quadruple, second manifestation of Sankarsana, all these different Visnus, Karana-toyasayi, Garbhodakasayi, Ksirodhi-sayi--in this way, expanding. Diparcir eva hi dasantaram abhyupetya. Just like you take one candle, then you lit up another candle, another candle, another candle. All these candles are equally powerful, but still, the calculation is, Krsna is the first candle, Balarama is the second candle. In this way, visnutaya vibhati--the expansion of Visnu, innumerable. Advaita acyuta anadi ananta-rupam. This Ksirodakasayi Visnu is the person who is situated in everyone's, every living being's, heart. Isvarah sarva-bhutanam hrd-dese 'rjuna tisthati. That isvara, antaryami, who is existing in everyone's heart, that is Ksirodakasayi Visnu. Not only within the heart of all living entities, but He is within the atom also. Andantara-stha-paramanu-caya... Paramanu. Paramanu means atom. In this way Visnu expansion are there. It is inconceivable for us, but by the grace of Krsna, we can partially understand from the description of the sastras. Otherwise we cannot imagine how these things can happen, but it happens. We have to accept. Sastra-caksusah. We have to see through the pages of sastra. Otherwise it is not possible. So if we want to know Visnu-tattva, if we want to know Krsna, His exalted position, then here are the description of the sastra, and if we take them as it is, without malinterpretation, without showing any extraordinary intelligence by us... It is not possible. We have to accept. Therefore the injunction is that you accept the statement of the sastras. That is... Bhagavad-gita also said, yah sastra-vidhim utsrjya vartate-kama-karatah: "If you do not follow the description of the sastra and if you manufacture something," then na siddhim sa avapnoti, "then you'll never get perfection." We have to follow the sastra; otherwise there is no other alternative to understand the exalted position of Krsna, how He expands in different forms, as Visnu, as Narayana. Sometimes they argue that Krsna is incarnation of Visnu. That is also truth. You'll find in Caitanya... Truth in this way, that when any incarnation comes, He comes through the Ksirobdhi-sayi Visnu. But Ksirobdhi-sayi is partial expansion of Krsna. The subject matter is very intricate, but if we follow the sastra and accept it, then some clear conception we can have. 690111PU.LA -- Purport to Sri Krsna Caitanya Prabhu Prabhupada: Sri-krsna-caitanya prabhu doya koro more, toma bina ke doyalu jagata-mayare. This is a song composed by Narottama dasa Thakura. He is praying Lord Caitanya that "My dear Lord, please be merciful upon me because who can be more merciful than Your Lordship within these three worlds?" Actually, this is the fact. Not only Narottama dasa Thakura, but also Rupa Gosvami, he also prayed for Lord Caitanya when both of them met at Prayaga, Allahabad, in the first meeting of Lord Caitanya and Rupa Gosvami at Prayaga. At that time, Srila Rupa Gosvami also said, "My dear Lord, You are the most munificent of all incarnations. Because You are distributing love of Krsna, Krsna consciousness." In other words, when Krsna was personally present, He simply asked us to surrender, but He did not distribute Himself so easily. He made condition that "First of all you surrender." But here, in this incarnation, Lord Caitanya, although He's Krsna Himself, He makes no condition. He simply distributes, "Take love of Krsna." Therefore Lord Caitanya is approved as the most munificent incarnation, and Narottama dasa Thakura says that "Please be merciful upon me. You are so magnanimous because You have seen the fallen souls of this age, and You are very much compassionate upon them. But you should know also that I am the most fallen. Nobody is a greater fallen than me." Patita-pavana-hetu tava avatara. "Your incarnation is just to reclaim the conditioned souls, fallen souls. But I assure You that You will not find a greater fallen than me. Therefore my claim is first." Then he prays to Lord Nityananda. He says, ha ha prabhu nityananda, premananda sukhi. "My dear Lord Nityananda, You are always joyful, in spiritual bliss, and You appear always very happy. So I have come to You because I am most unhappy. So if You kindly put Your glance over me, then I may also become happy." Then he prays to Advaita Prabhu: ha ha prabhu sita-pati advaita gosai. Advaita Prabhu's wife's name was Sita. Therefore He is sometimes addressed as sita-pati. So "My dear Advaita Prabhu, the husband of Sita, please You also be kind upon me because if You become kind upon me, then naturally Lord Caitanya and Nityananda also will be kind upon me." The reason is that actually, Advaita Prabhu invited Lord Caitanya to come down. When Advaita Prabhu saw the fallen souls, they are all engaged simply in sense gratificatory processes without understanding Krsna consciousness, He felt very much compassionate upon the fallen souls, and He felt Himself as incapable of claiming all these fallen souls. He therefore prayed to Lord Krsna that "You come Yourself. Without Your personal presence, it is not possible to deliver these fallen souls." So by His invitation Lord Caitanya appeared. "Naturally..." Narottama dasa Thakura prays Advaita Prabhu that "If You be kind upon me, naturally Lord Caitanya and Nityananda also will be kind upon me." Then he prays to the Gosvamis. Ha ha svarupa, sanatana, rupa, raghunatha. 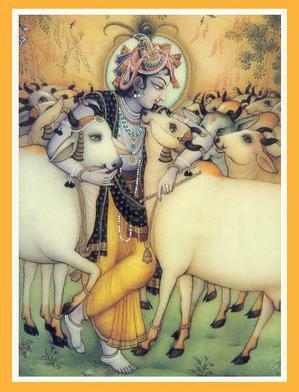 "My dear Gosvami Prabhus," svarupa. Svarupa was Svarupa Damodara was personal secretary of Lord Caitanya. He was always keeping with Caitanya Mahaprabhu, and whatever He wanted, he immediately arranged for that. Two personal attendants, Svarupa Damodara and Govinda, they were always, constantly with Lord Caitanya. So Narottama dasa Thakura also praying Svarupa Damodara. And then the Gosvamis. The next disciples of Lord Caitanya were the six Gosvamis: Sri Rupa, Sri Sanatana, Sri Bhatta Raghunatha, Sri Gopala Bhatta Gosvami, Jiva Gosvami, and Raghunatha dasa Gosvami. These six Gosvamis were directly instructed by Lord Caitanya for spreading this movement of Krsna consciousness. Narottama dasa Thakura is praying also their mercy. And after the six Gosvamis, the next acarya was Srinivasa Acarya. So he's also praying Srinivasa Acarya. BG 2.13: As the embodied soul continuously passes, in this body, from boyhood to youth to old age, the soul similarly passes into another body at death. A sober person is not bewildered by such a change. BG 2.14: O son of Kuntī, the nonpermanent appearance of happiness and distress, and their disappearance in due course, are like the appearance and disappearance of winter and summer seasons. They arise from sense perception, O scion of Bharata, and one must learn to tolerate them without being disturbed. BG 2.15: O best among men [Arjuna], the person who is not disturbed by happiness and distress and is steady in both is certainly eligible for liberation. BG 2.16: Those who are seers of the truth have concluded that of the nonexistent [the material body] there is no endurance and of the eternal [the soul] there is no change. This they have concluded by studying the nature of both. BG 2.17: That which pervades the entire body you should know to be indestructible. No one is able to destroy that imperishable soul. BG 2.20: For the soul there is neither birth nor death at any time. He has not come into being, does not come into being, and will not come into being. He is unborn, eternal, ever-existing and primeval. He is not slain when the body is slain. BG 2.23: The soul can never be cut to pieces by any weapon, nor burned by fire, nor moistened by water, nor withered by the wind. BG 2.24: This individual soul is unbreakable and insoluble, and can be neither burned nor dried. He is everlasting, present everywhere, unchangeable, immovable and eternally the same. BG 2.25: It is said that the soul is invisible, inconceivable and immutable. Knowing this, you should not grieve for the body. BG 2.27: One who has taken his birth is sure to die, and after death one is sure to take birth again. Therefore, in the unavoidable discharge of your duty, you should not lament. BG 2.29: Some look on the soul as amazing, some describe him as amazing, and some hear of him as amazing, while others, even after hearing about him, cannot understand him at all. BG 9.2: This knowledge is the king of education, the most secret of all secrets. It is the purest knowledge, and because it gives direct perception of the self by realization, it is the perfection of religion. It is everlasting, and it is joyfully performed. BG 7.7: O conqueror of wealth, there is no truth superior to Me. Everything rests upon Me, as pearls are strung on a thread. BG 10.41: Know that all opulent, beautiful and glorious creations spring from but a spark of My splendor. BG 16.1-3: Fearlessness; purification of one's existence; cultivation of spiritual knowledge; charity; self-control; performance of sacrifice; study of the Vedas; austerity; simplicity; nonviolence; truthfulness; freedom from anger; renunciation; tranquillity; aversion to faultfinding; compassion for all living entities; freedom from covetousness; gentleness; modesty; steady determination; vigor; forgiveness; fortitude; cleanliness; and freedom from envy and from the passion for honor — these transcendental qualities, O son of Bharata, belong to godly men endowed with divine nature. And these four verses are considered by some to be the most important. BG 10.8: I am the source of all spiritual and material worlds. Everything emanates from Me. The wise who perfectly know this engage in My devotional service and worship Me with all their hearts. BG 10.9: The thoughts of My pure devotees dwell in Me, their lives are fully devoted to My service, and they derive great satisfaction and bliss from always enlightening one another and conversing about Me. BG 10.10: To those who are constantly devoted to serving Me with love, I give the understanding by which they can come to Me. BG 10.11: To show them special mercy, I, dwelling in their hearts, destroy with the shining lamp of knowledge the darkness born of ignorance. BG 18.65: Always think of Me, become My devotee, worship Me and offer your homage unto Me. Thus you will come to Me without fail. I promise you this because you are My very dear friend. BG 18.66: Abandon all varieties of religion and just surrender unto Me. I shall deliver you from all sinful reactions. Do not fear. BG 18.68: For one who explains this supreme secret to the devotees, pure devotional service is guaranteed, and at the end he will come back to Me. BG 18.69: There is no servant in this world more dear to Me than he, nor will there ever be one more dear. The next incarnations are the Manus. Within one day's duration of the life of Brahmā (which is calculated by our solar year as 4,300,000 x 1,000 years) there are fourteen Manus. Therefore there are 420 Manus in one month of Brahmā and 5,040 Manus in one year of Brahmā. Brahmā lives for one hundred years of his age, and therefore there are 5,040 x 100 or 504,000 Manus in the duration of Brahmā's life. There are innumerable universes, with one Brahmā in each of them, and all of them are created and annihilated during the breathing time of the puruṣa. Therefore one can simply imagine how many millions of Manus there are during one breath of the puruṣa. The duration of the material universe is limited. It is manifested in cycles of kalpas. A kalpa is a day of Brahmā, and one day of Brahmā consists of a thousand cycles of four yugas or ages: Satya, Tretā, Dvāpara, and Kali. The cycle of Satya is characterized by virtue, wisdom and religion, there being practically no ignorance and vice, and the yuga lasts 1,728,000 years. In the Tretā-yuga vice is introduced, and this yuga lasts 1,296,000 years. In the Dvāpara-yuga there is an even greater decline in virtue and religion, vice increasing, and this yuga lasts 864,000 years. And finally in Kali-yuga (the yuga we have now been experiencing over the past 5,000 years) there is an abundance of strife, ignorance, irreligion and vice, true virtue being practically nonexistent, and this yuga lasts 432,000 years. In Kali-yuga vice increases to such a point that at the termination of the yuga the Supreme Lord Himself appears as the Kalki avatara, vanquishes the demons, saves His devotees, and commences another Satya-yuga. Then the process is set rolling again. These four yugas, rotating a thousand times, comprise one day of Brahmā, the creator god, and the same number comprise one night. Brahmā lives one hundred of such "years" and then dies. These "hundred years" by earth calculations total to 311 trillion and 40 million earth years. By these calculations the life of Brahmā seems fantastic and interminable, but from the viewpoint of eternity it is as brief as a lightning flash. In the causal ocean there are innumerable Brahmās rising and disappearing like bubbles in the Atlantic. Brahmā and his creation are all part of the material universe, and therefore they are in constant flux. The different forms of the living entities are different dresses offered by the illusory, external energy of the Lord according to the modes of nature the living being desires to enjoy. The external, material energy is represented by her three modes, namely goodness, passion and ignorance. So even in the material nature there is a chance of an independent choice by the living entity, and according to his choice the material energy offers him different varieties of material bodies. There are bodies, 1,100,000 worms and reptiles, 1,000,000 forms of birds, together there are 8,400,000 varieties of bodies in different planets of the universe, and the living entity is traveling by so many transmigrations according to different modes of enjoying spirit within himself. Even in one particular body the living entity changes from childhood to boyhood, from boyhood to youth, from youth to old age and from old age to another body created by his own action. The living entity creates his own body by his personal desires, and the external energy of the Lord supplies him the exact form by which he can enjoy his desires to the fullest extent. The tiger wanted to enjoy the blood of another animal, and therefore, by the grace of the Lord, the material energy supplied him the body of the tiger with facilities for enjoying blood from another animal. Similarly, a living entity desiring to get the body of a demigod in a higher planet can also get it by the grace of the Lord. And if he is intelligent enough, he can desire to get a spiritual body to enjoy the company of the Lord, and he will get it. Misguided men are suffering in the darkness of materialism, and their so-called learning has enabled them to discover the atomic bomb. They are consequently on the verge of annihilation. In that abode there is no need of light from sun, moon or fire. The planets are self-luminous. Life there is perpetual and full of knowledge and bliss. Lord Krsna, in the Bhagavad-gita, also informs us that this material world is full of miseries in the shape of birth, old age, disease and death. Even in the topmost planet of the material universe, Brahmaloka, these miseries are present. Only in His own abode is there a total absence of misery. In that abode there is no need of light from sun, moon or fire. The planets are self-luminous. Life there is perpetual and full of knowledge and bliss. That is what is known as sanatana-dharma. It is therefore natural to conclude that the living entities must return home, back to Godhead, to enjoy life in the sanatana-dhama with the sanatana-purusa, or the purusottama, Lord Sri Krsna. They must not remain to rot in this miserable land of material existence. There is no happiness in the material sphere--even in Brahmaloka--so plans and activities for elevation to higher planets within the material universe are carried out by those who are less intelligent. Less intelligent men also take shelter of demigods and only derive benefits which endure for a limited period. Thus their religious principles and the benefits derived therefrom are only temporary. The intelligent man, however, abandons all engagements in the name of religion and takes shelter of the Supreme Personality of Godhead and thus receives absolute protection from the Almighty Father. Sanatana-dharma is therefore the process of bhakti-yoga, by which one can come to know the sanatana Lord and His sanatana abode.By this process only can one return to the spiritual universe, the sanatana-dhama, to take part in the sanatana enjoyment prevailing there. A Hindu may become a Muslim or a Muslim may become a Hindu or Christian, etc., but in all circumstances there is one constant. There is reference to the word sanatanam in the tenth verse of the Seventh Chapter, in which the Lord says that He is the eternal fountainhead of everything and is therefore sanatanam. The fountainhead of everything is described in the Upanisads as the complete whole. All emanations of the fountainhead are also complete in themselves, but although many complete units emanate from the complete sanatana fountainhead, the sanatana remains unchanged.That is because the nature of sanatana is unchangeable. Anything that changes under the influence of time and circumstances is not sanatana. Therefore anything that changes whatsoever in form or quality cannot be accepted as sanatana. To give a material example, the sun has been disseminating its rays for hundreds and millions of years, and yet although it is a materially created object, its form and rays are still unchanged. Therefore, that which is never created cannot change in formation and quality, even though He is the seedling source of everything. Vince on Krishnamurti : He's writing books, and he says, "There is no need of books." debajyoti on we know that actual progress in scientific knowledge will certainly take men to the spiritual sky and inform the scientist that there is a supreme creator. seshu on We are dynamic forces, and God does not interfere with our dynamic force. Aioliki on A Hindu may become a Muslim or a Muslim may become a Hindu or Christian, etc., but in all circumstances there is one constant. aipim on Krishnamurti : He's writing books, and he says, "There is no need of books."